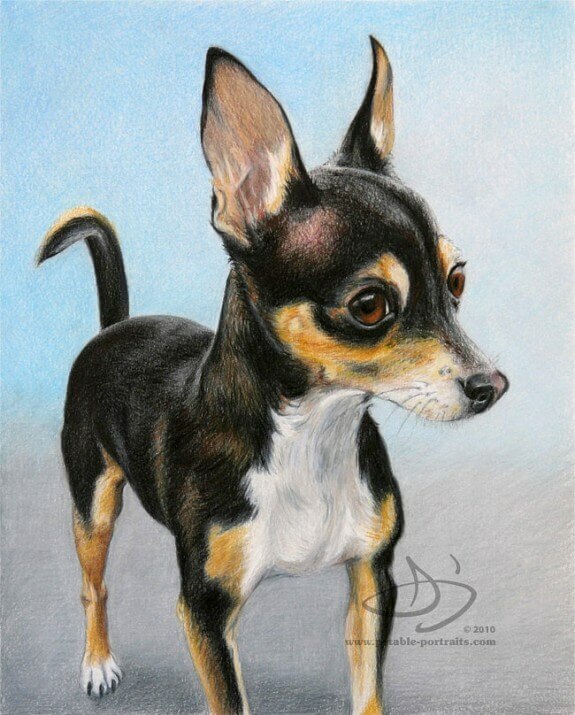 My name is Daniele Jones, I'm a pet portrait artist and I would love to capture and preserve the spirit and personality of your cherished furry friends in an original pet drawing or painting. I love to hear about your pet and always feel like I get to know them a little bit through you. 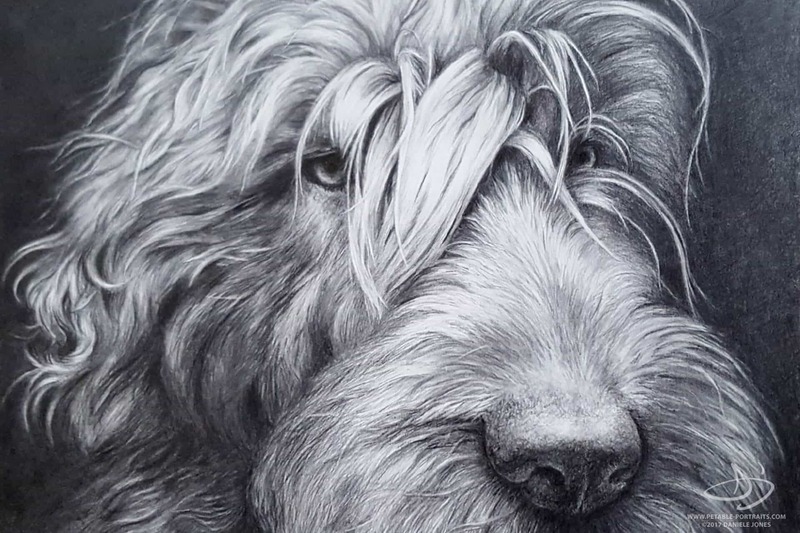 My realistic pet portraits celebrate the love you feel for your one-of-a-kind pet. Knowing what to emphasize and what to remove from a photo is a key to a great portrait. Ideas and photos can also be combined to create something completely new. 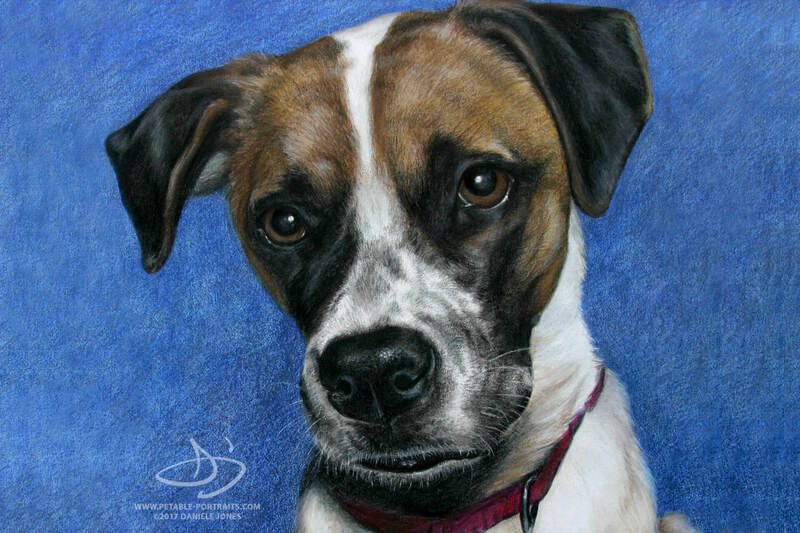 By putting your pet center stage, capturing their unique spark and removing distractions common in photos, a pet portrait becomes much more than just a drawing from a photo, it's a treasured artwork. Almost any photo will work for me. Send a single photo and I'll make you a beautiful portrait. Send several photos, and I can combine, imagine, and use some creativity to make a portrait that's inspired by all of them but not exactly like any individual photo. 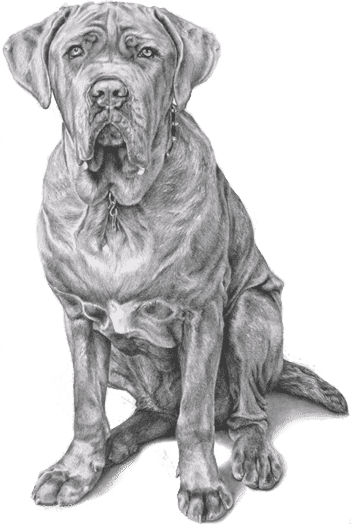 Using skills practiced over a lifetime, I can create artwork especially for you or as a thoughtful gift for a loved one. We know our loved ones won't be with us forever. 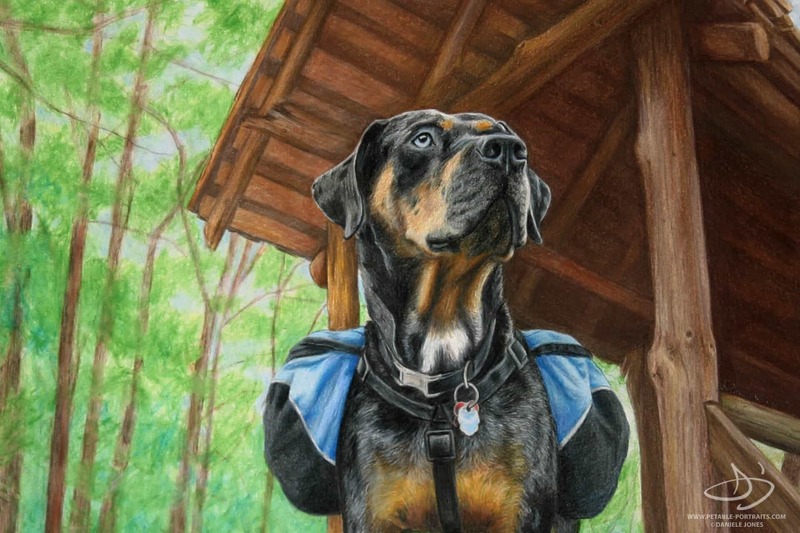 A pet portrait helps you remember the love and kinship you felt. 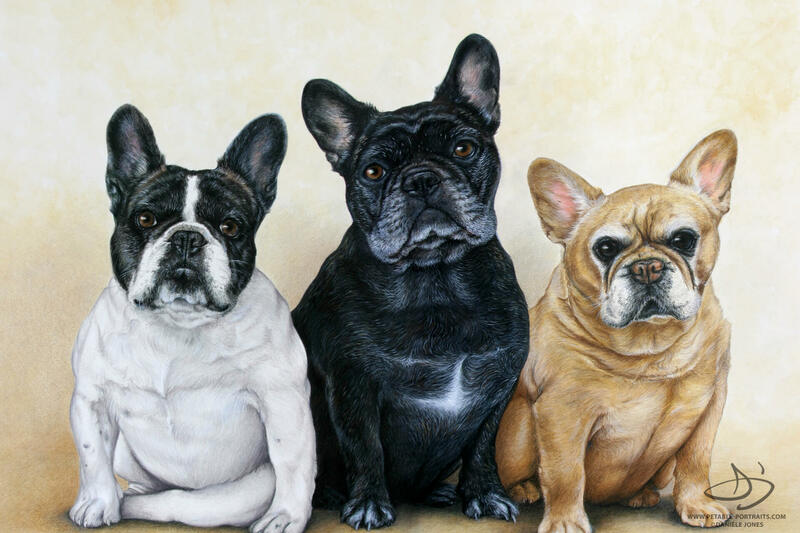 Hanging on your wall will be a beautiful reminder of how special that furry friend was to you. 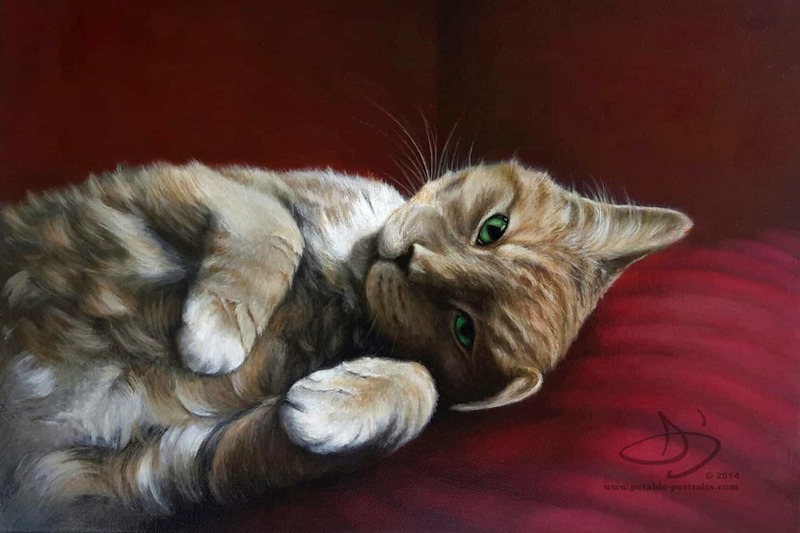 If you're considering a pet portrait you may already know how personal and touching art can be. 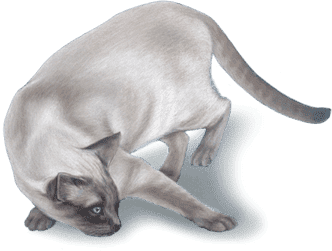 You may have an urn, a collar, and a folder of photos – but what you really want is to see your companion and feel the connection you had with that special pet. I do my best to capture your feelings and put them on paper or canvas. 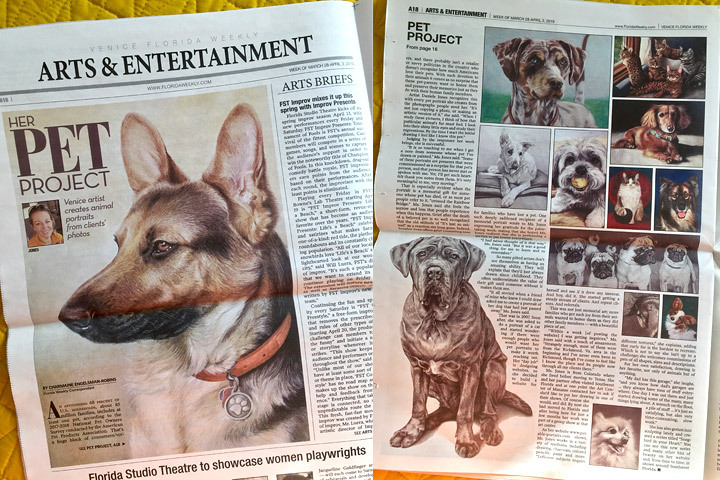 Snapshots and stories mixed with artistry creates a treasured remembrance of your four-legged loved one. 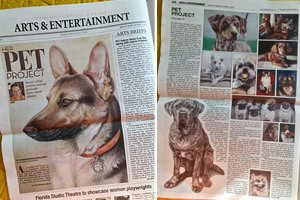 Here are a few of my most recent pet portrait commissions. Mouse over for a bit of info. Love this dog and love his family! What a perfect name for this beauty. 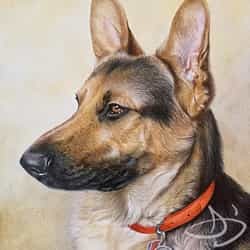 This German Shepherd is noble and majestic. 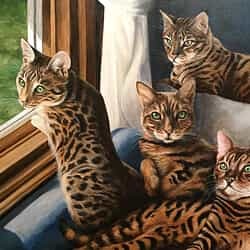 Each cat was in a different photo - what a challenge! 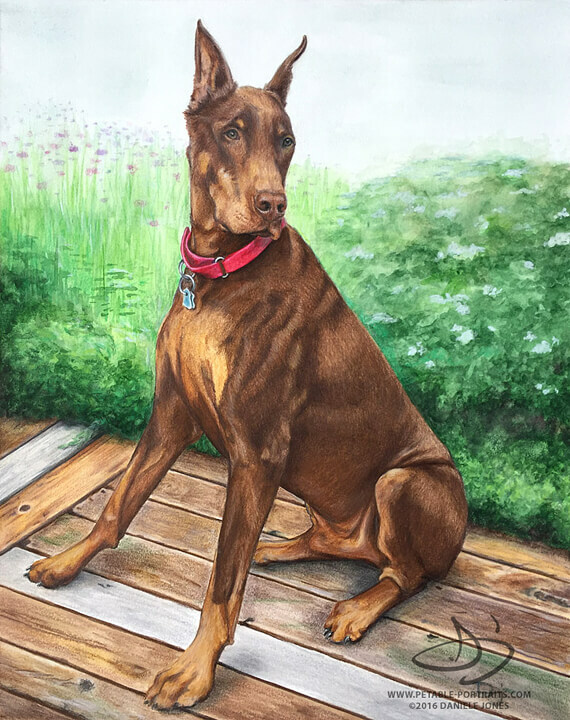 My friends arranged for you to paint my Doberman, Kane, after he passed away. That was one of the most amazing and meaningful gifts I've ever received, and your work is magnificent. 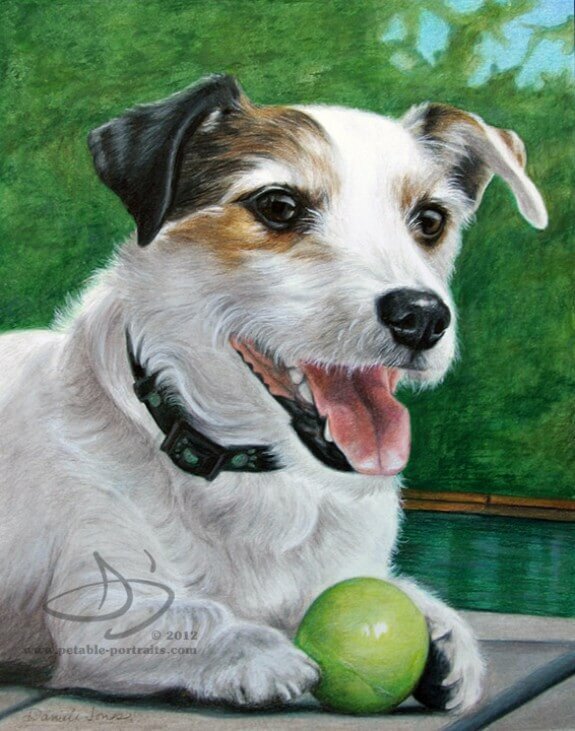 You captured his personality and his soulful eyes so wonderfully - I can't express how much I love the painting. Thank you for doing what you do. 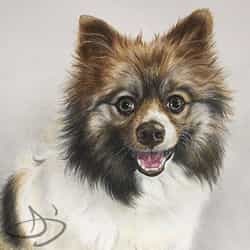 You make it sound easy, but "Scruffy" is one of the most professionally skillful portraits (of an animal or a person) I've ever seen! 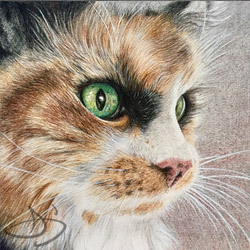 You have an incredible technique and ability with colored pencils. All the color and lines you have in the piece work together so beautifully. He's so beautifully orchestrated and alive. We would like to express our gratitude and to compliment you on such a beautiful job. 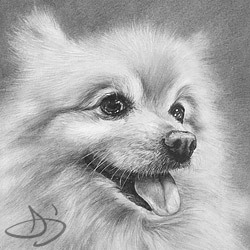 You managed to capture his essence, and it will be a portrait that will be cherished forever. 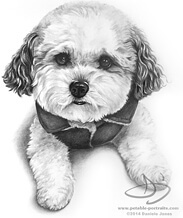 We miss the little guy very much, and the portrait was a deeply meaningful gift to receive Christmas morning. Thank you so much. You truly have a gift. look for me on page 16.